Connects up to 3 devices into a single power outlet. This current tap's space-saver & right-angle design connects power cords without bending and put furniture closer to the wall. Ideal for home and office applications including server enclosures or racks with tight spaces. UL Listed. 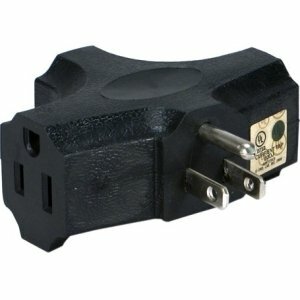 Marketing Information: Connects up to 3 devices into a single power outlet. This current tap's space-saver & right-angle design connects power cords without bending and put furniture closer to the wall. Ideal for home and office applications including server enclosures or racks with tight spaces. UL Listed.